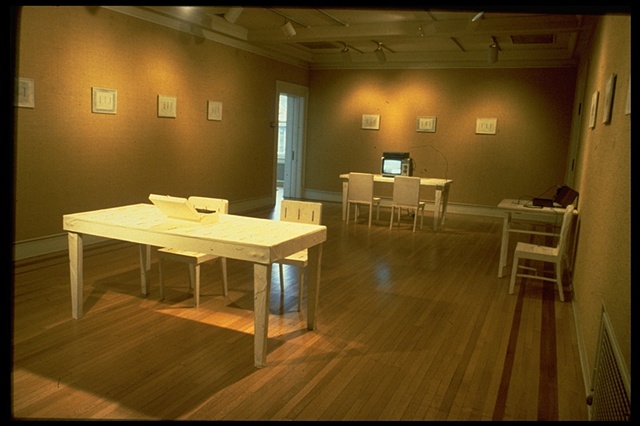 In a former family mansion three rooms were sparsely furnished with tables, chairs, and beds, all covered with stained white "skins" of paper and rows of rusted nails. Each item of furniture held a machine: one that incessantly counted, one that measured humour, one that shook a can of nails, one that spilled out a roll of text, one that played a video of nails being hammered into a block of wood, and a locked closet that emitted ancient laments from two out-of-synch tape loops. The mansion rooms were once again populated, but by empty, dysfunctional furniture. The real subjects of the installation were conspicuous by their absence.